There are 40 Assisted Living Facilities in the Lafayette area, with 3 in Lafayette and 37 nearby. The average cost of assisted living in Lafayette is $4,015 per month. This is higher than the national median of $3,346. Cheaper nearby regions include Northglenn with an average starting cost of $3,097. To help you with your search, browse the 291 reviews below for assisted living facilities in Lafayette. On average, consumers rate assisted living in Lafayette 4.3 out of 5 stars. Better rated regions include Westminster with an average rating of 4.4 out of 5 stars. Caring.com has helped thousands of families find high-quality senior care. To speak with one of our Family Advisors about assisted living options and costs in Lafayette, call (855) 863-8283. Lafayette, Colorado serves as an unofficial suburb to both the Boulder and Denver metropolitan areas, allowing its senior residents access to both cities. It was named as the fourth best place in the nation for seniors to live by AARP Magazine in recent rankings. The suburb is best known for Waneka Lake Park, a recreational and wildlife refuge which features swimming, fishing and 147 acres to explore. Seniors who enjoy this environment have five dozen assisted living communities to choose from. Six are located within Lafayette and 54 are located in nearby communities. All assisted living facilities in Lafayette follow the same guidelines as others across the state, providing room and board, along with 24-hour care to residents. The weather in Lafayette constitutes four defined seasons. In the cold, snowy winter months temperatures dip into the teens and summer heat waves spikes temperatures into the 90s. Due primarily to its proximity to the cities of Boulder and Denver, the air quality in Lafayette is considered moderate throughout the year. Pollen also affects the air quality on a seasonal basis. The cost of living in Lafayette is higher than both the state and national averages. However, costs of necessities, like groceries, health care services and utilities are at or below the national average. The crime rate in Lafayette is higher than most suburbs but below the state and national average. Lafayette is considered 24 percent safer than most American cities. Via Colorado provides discounted transportation to those over the age of 60. Most of these transportation companies will take seniors anywhere in the greater Boulder and Denver metropolitan area. RTD also operates the area's public bus service, which has discounted fares for seniors age 65 and older with a valid ID. Lafayette has a steady stream of art shows on the street and in local galleries, as well as opera, orchestral and chamber music available to residents on a regular basis. Assisted Living costs in Lafayette start around $4,015 per month on average, while the nationwide average cost of assisted living is $4,000 per month, according to the latest figures from Genworth’s Cost of Care Survey. 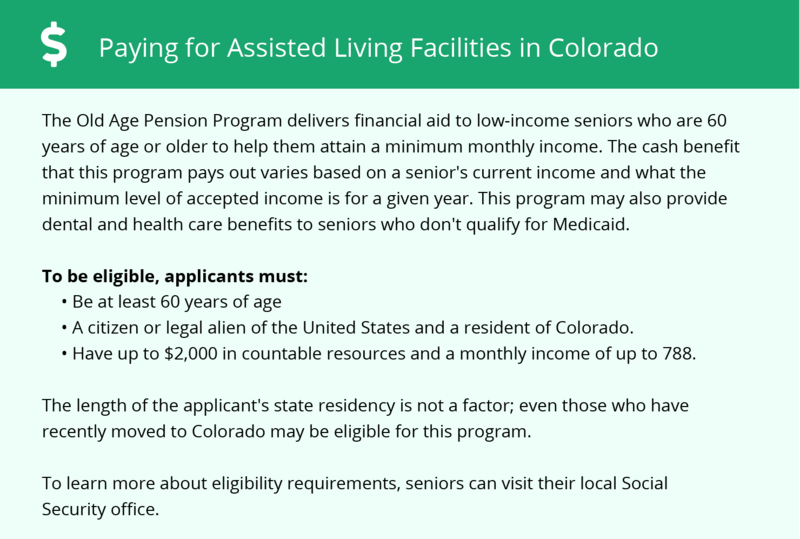 The state of Colorado also has a Old Age Pension (or OAP) which provides financial assistance to elderly, low-income Colorado residents over the age of 60. 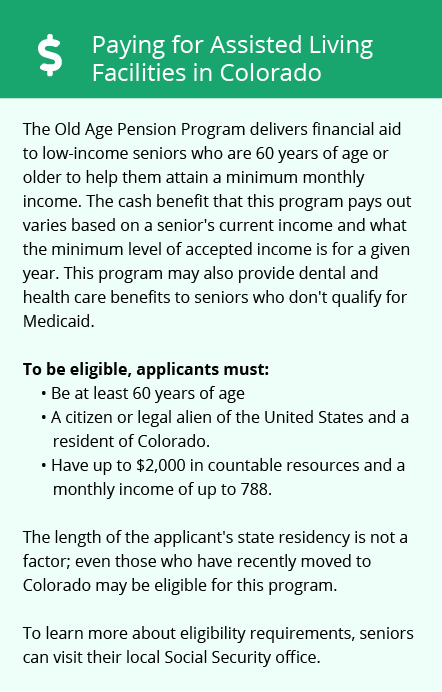 Boulder County also offers financial assistance to senior Lafayette residents who apply. To see a list of free assisted living resources in Lafayette, please visit our Assisted Living in Colorado page. Lafayette-area assisted living communities must adhere to the comprehensive set of state laws and regulations that all assisted living communities in Colorado are required to follow. Visit our Assisted Living in Colorado page for more information about these laws.